John Henry Belter Rosalie Pattern Gentleman's Chair (ca.1860). Recently I had the opportunity to do some repair work on a chair made by the firm of John Henry Belter of New York City, circa 1860. 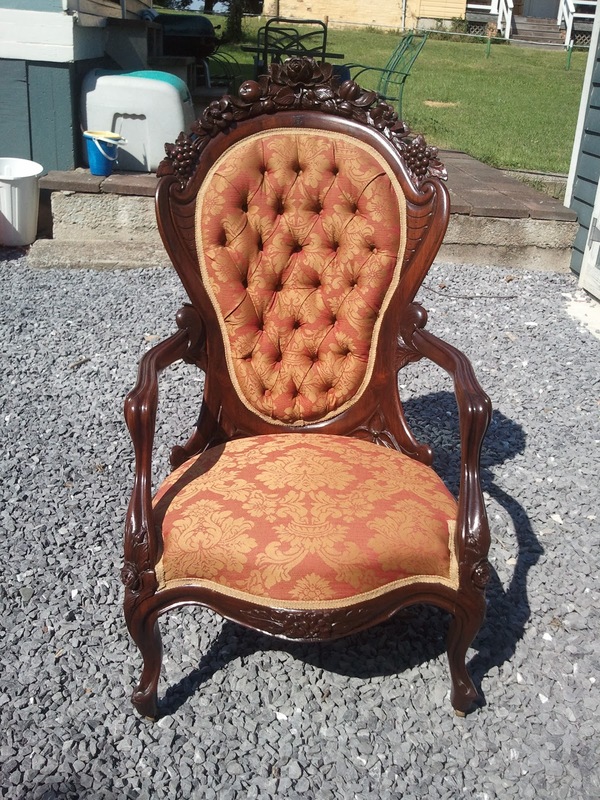 The chair is part of a parlor set and is considered a "Gentleman's Chair". This designation is due to its proportions as well as the presence of arms. 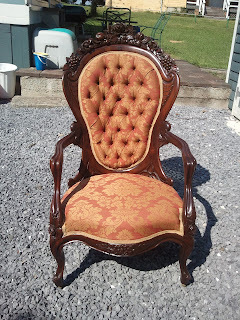 Other pieces in a typical parlor set of the time would often have included smaller side chairs without arms, a ladies chair with or without arms, and also a sofa. 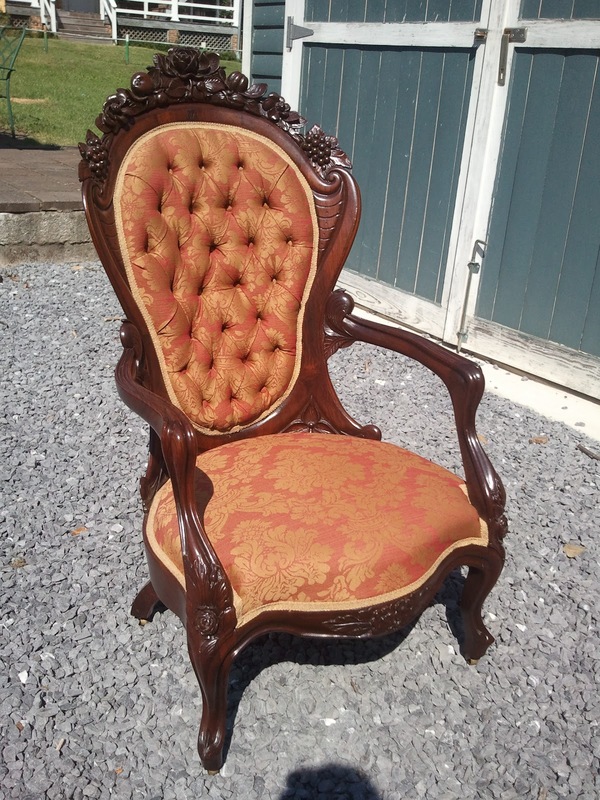 This particular chair comes from a set including four side chairs as well as a sofa. I believe the entire set to be of the same pattern and all by John Henry Belter. John Henry Belter was one of the preeminent American cabinetmakers of the19th century and much has been written about his furniture. 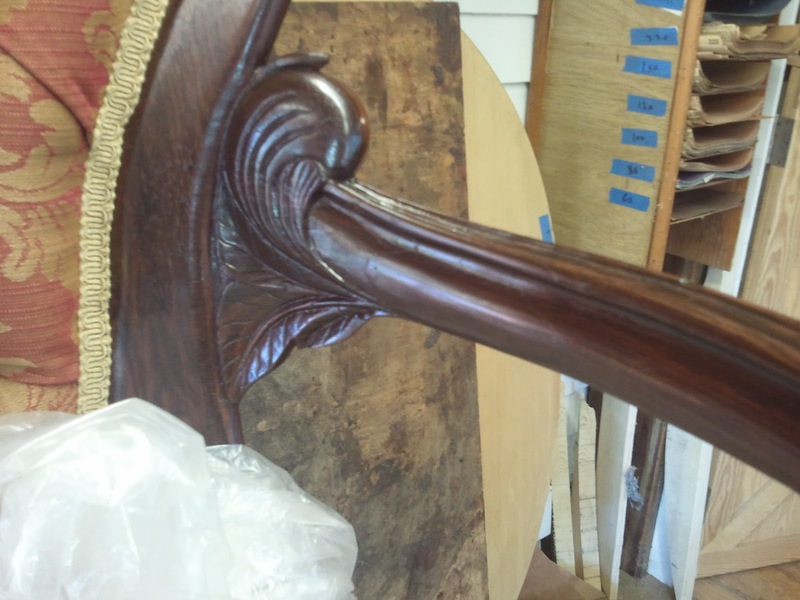 What is interesting about his work is the use of Rosewood as a primary wood and the lengths he went to to overcome the inherent weaknesses of this wood. The most interesting of these was the use of laminated veneers oriented in plys, much like modern plywood. These veneers would be oriented with the grain direction of each ply set at right angles as they were stacked to create a solid piece that was strong and could be bent to fit forms or "cauls" that would create the desired shape. The backs of these pieces and this chair were made using this process of lamination. The result was that the chair was sturdy and could withstand normal stresses that might crack rosewood. As I mentioned above, a lot has been written about Belter and his furniture. A simple Google search will give you ample insight into his back story and show many examples of his work. 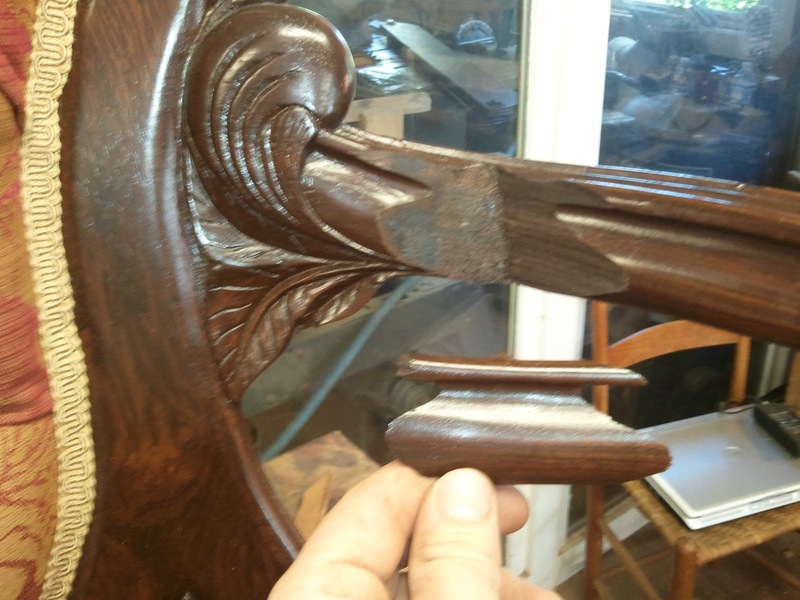 As a craftsman, the thing that fascinated me about Belter and other contemporary cabinet makers was how they not only transitioned from a pre-industrial mindset to an industrial mindset in their work during, but how well they did this. The blending of hand work and pre-fabricated parts in these pieces is done with precision and equal attention is given to the structural design and what visual forms could be exploited while mantaining that structure. The adoption of laminatied backs on these chairs allowed Belter to not only create something that was structurally superior to the same piece made from solid wood, but also to to transcend some of the visual design elements of those solid wood pieces and create something visually superior as well. It is no wonder that this furniture held the attention of the public at the time and continues to do so today. In terms of identification, I usually restrain myself from attributing a piece to a specific maker without sufficient proof. 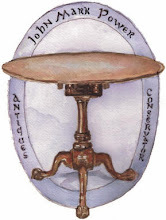 This proof was given in a book entitled The Furniture of John Henry Belter and the Rococo Revival By Marvin D. Schwartz, Edward J. Stanek, and Douglas K. True Written in 1981. This book delivers all of the information known at the time of writing about John Henry Belter and his work. If you are a owner of one of his pieces I urge you to find a copy of it and read it. Even if you have an interest in Rococo Revival furniture or Furniture attribution or Furniture in general, I urge you to buy this book! It is facinating!! One particular chapter I found to be of interest was the chapter entitled " Technical Observation". In it Mr. Stanek and Mr. True lay out all of the findings of how these pieces were made and patterns that emerge from close examination of several pieces that allow one to come to a near conclusive attribution. The pains that these men went to to discover the common features of these pieces is astounding and greatly appreciating. Some common features that helped me with attribution were the amount of veneers used to make up the back, the thickness of each veneer, the casters used, etc. Their assessment of these chairs was very thorough! 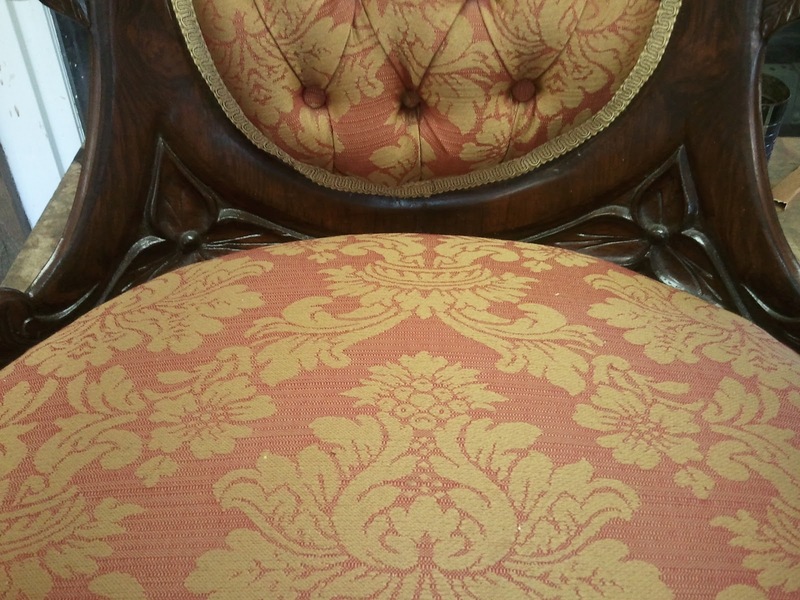 The term "Rosalie Pattern" comes from a parlor set that was identified as made by Belter with very a very complete provenance. The set that carries the provenance is said to have been bought from Belter by Ms. Fannie McMurtry Wilson, who brought the pieces home from NewYork to her Mansion called Rosalie in Natchez, Mississippi. Even though no piece in this set carries a Belter label, The history is good enough to attach attribution. This pattern employed the use of grapes and roses as well as what look to be trillium flowers in the lower back. This was a popular design and pieces can be found fairly regularly in this Rosalie pattern. Absent from this design is Belter's use of pierced laminations that can seen on some of his work. 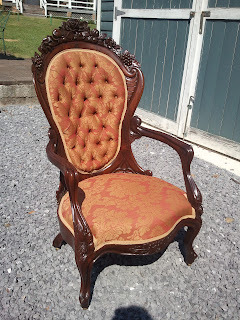 regardless of this, the proportions of these chairs are wonderful and the detail given to the carving as well as the overall construction set them above and beyond other pieces of the Rococo Revival era. 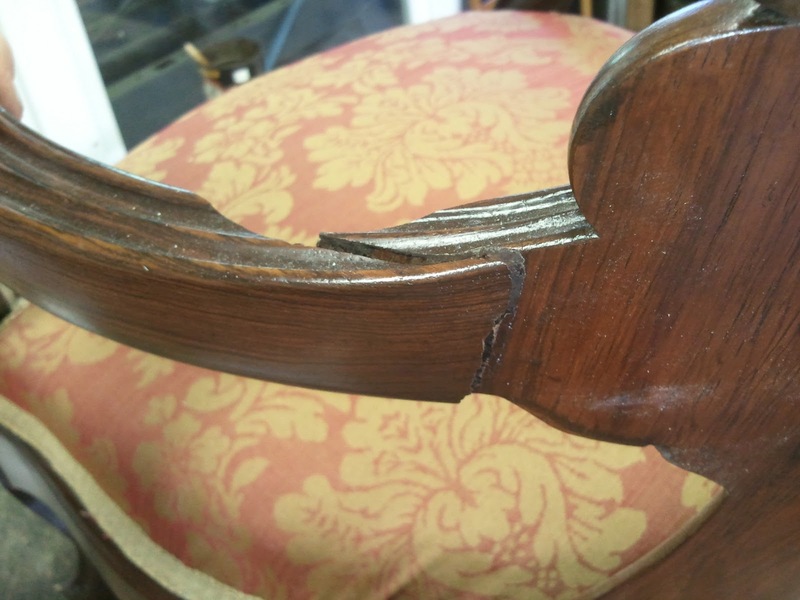 As far as the repair is concerned, The chair had suffered a break to one of the arms. 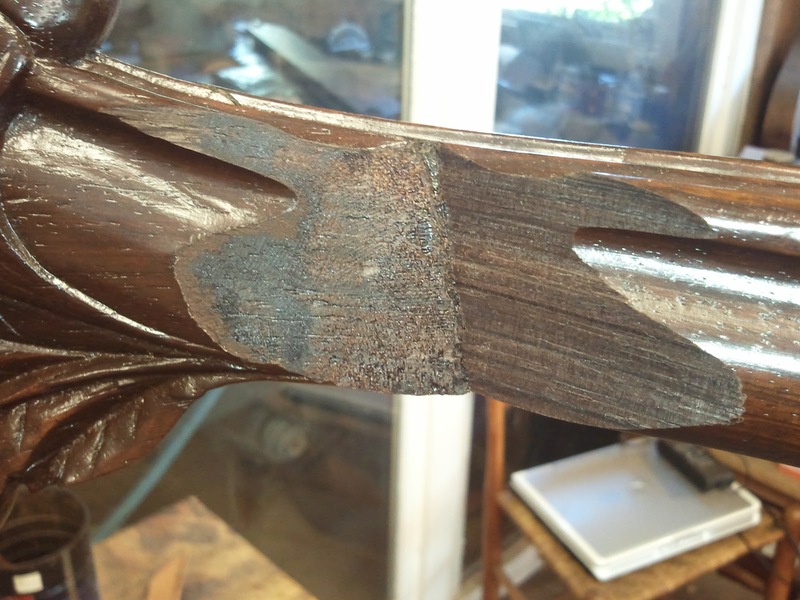 The break was along a joint as well as along the grain of the arm itself, so a piece was broken away entirely. 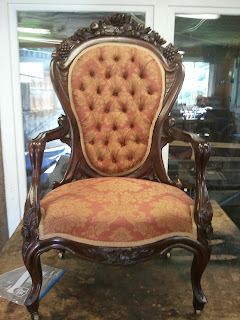 Below are a few photos of the chair and the repair I made to it. 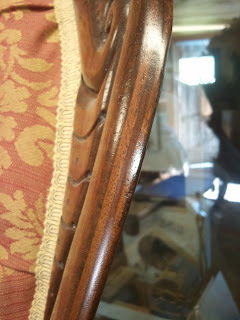 The first four photos are of the chair itself .The first shows the chair from the front, the second shows the chair from the back. 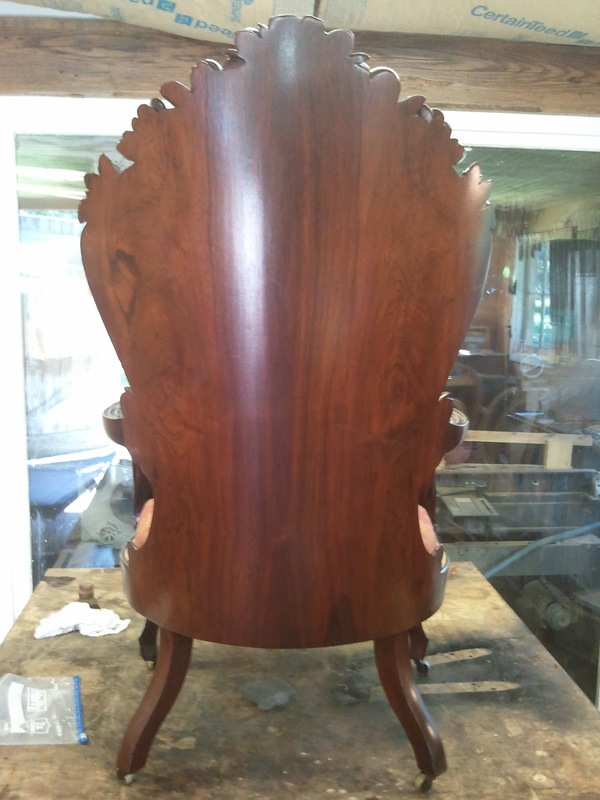 The backs were typically made solid and the back made from two bookmatched Rosewood veneers.Because of this the backs can be quite striking. 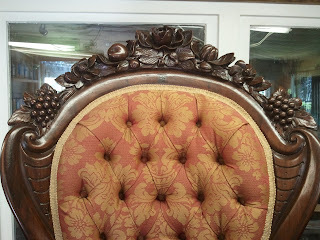 The third photo is a detail of the carving done along the crest rail and the fourth details the "trillium" carving in the lower back. This next photo shows the laminations that create the back. One has to look closely to see them but they are there! These next three photos detail the break to the arm. One thing that can be seen in this photo is how much darker the interior wood is. Rosewood lightens with age and because of this, extra care was made in positioning the broken pieces when they were glued to get the best possible fit. This would eliminate any unnecessary sanding that might cut through the lighter exterior and show the dark interior of the wood. The third photo shows the piece that had broken off of the arm. 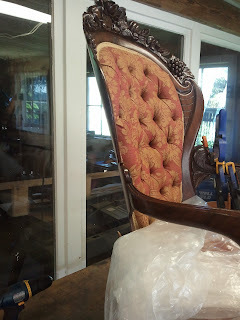 I included this photos taken from the side to show how thin Belter was able to make the backs of his chairs. 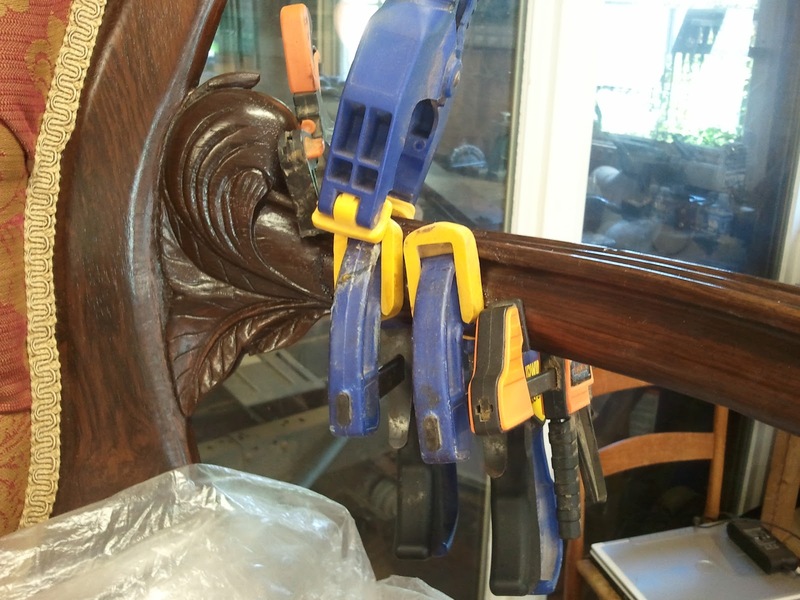 This would have been impossible with a solid wood chair. The result is a streamlined design with structural soundness. This photo shows the repair to the arm after it was completed and the clamps removed. 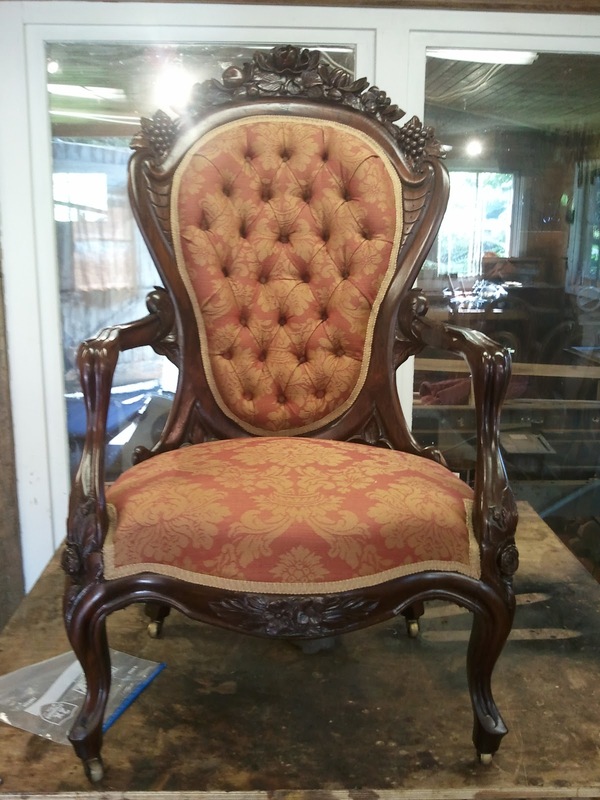 These last photos show the completed chair. It was a great opportunity to work on a chair with such a rich and fascinating history.